Offering you a complete choice of products which include electrical rubber mats. We manufacture and supply tough long lasting Electrical Rubber Mats which insulates against electrical shock around electrical equipment. These Electrical Rubber Mats are designed to protect operator doing electricity-related work from electric shocks. We hold expertise in offering a wide range of Electrical Rubber Mats. These Electrical Rubber Mats are available with us in various range, designs, dimensions. Offering a wide range of Electrical Rubber Mats to our valuable client.These mats are manufactured out of rubber compound of high quality natural rubber and are used as floor covering around electrical panels as a safeguard to the life. These rubber mats are used in power generation plants, sub-stations, and workshops. The surface of these rubber mats have chequered, anti-skid fluted design on one side and plain at bottom as per the requirement of the purchaser. We hold expertise in offering a wide range of Insulating Electrical Rubber Mats. Our products are widely recommended by clients owing to its precise design, rugged construction and longer functional life. Our finely designed products are acclaimed for their effective usage and consistent performance. These Electrical Rubber Mats are offered at market leading rates. 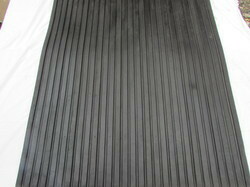 The prime concern for the development of Electrical Rubber Mats is human safety. These high voltage insulating mats are developed as floor covering for the protection of workers on AC & DC installations with the system voltages upto 33 KV & 240 V DC. The insulating mats are made from Synthetic elastomer. The insulation mats provide the technicians with added safety and increases their productivity.